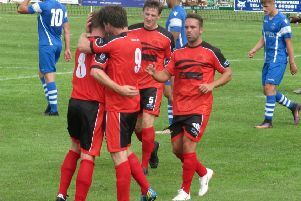 Garstang were beaten 3-1 at AFC Blackpool in midweek as they embarked on the first of four straight away games. Jack Bennett was out injured, replaced by Shaun Sailor, while Jack Swindlehurst was recalled. On a hard, bumpy pitch, Garstang looked off the pace in the first half with the visitors winning all the 50-50s. Despite the lacklustre performance Garstang thought they had taken an early lead when Jonny Hothersall whipped in a perfect cross for Ric Coar to head home from close range, only for an offside flag to halt their celebrations. The deadlock was broken on 15 minutes when Conah Bishop got behind the defence and fired past Will Kitchen. The game turned on another controversial incident 10 minutes later when Swindlehurst was fouled on the edge of the box and dispossesed by Bishop, who had a clear run on goal and scored to make it 2-0 at half-time. For reasons unknown, the home side seemed to lose the plot in the second half as they ended up with seven yellow cards. However, they scored a third on the hour when a defensive error allowed the hosts to have two clear strikes at goal from inside the box. Kitchen saved well on both occasions but the second stop rebounded straight to Jack Sharples, who tapped home. Coar cut the deficit from close range three minutes later and Swindlehurst headed against the post but it wasn’t enough and the home side saw out the game.